The origin of the investment casting process, also known as the lost wax process, stretches back in time to 1100/1700 BC. Works of art were created from hand sculptured wax patterns with delicate detail as sophisticated as any precision investment casting produced today. Industrial America paid little heed to the capabilities of Investment Castings in Lost Wax until WWII, when sudden military demands overtaxed the machine tool industry. By injecting wax into a permanent-molding die to form a pattern, investment casting became the solution for many complex parts that were required in staggering quantities. During the postwar period, this process has evolved and expanded into virtually every industry and marketplace, as seen today. 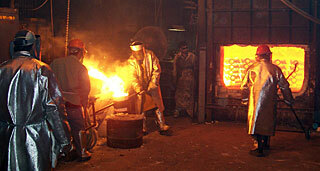 Chicago Vacuum Casting has become a leader in the manufacturing of Investment Castings in lost wax.